» Vintage Patriotic Guest Room- Progress! Vintage Patriotic Guest Room- Progress! So as you know, my brother flew the coop in May, and we’ve been rearranging the 2 extra bedrooms ever since. 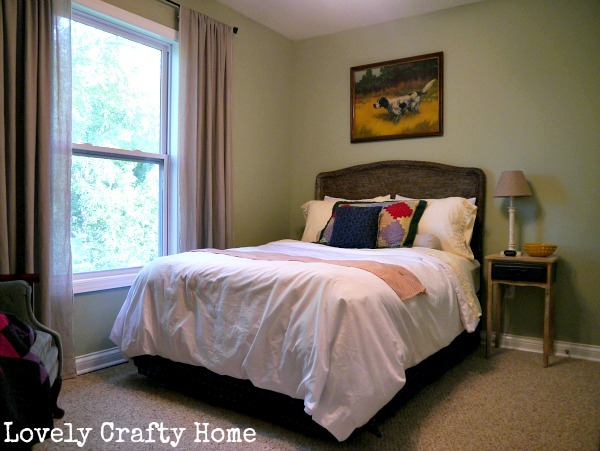 I decided to turn his room into the guest room, and the old guest room into my craft/sewing room. You’ll have to pardon my strange angle pictures, it’s very hard to photograph this room from the hallway, and then once you’re in it…well it’s just even more difficult. 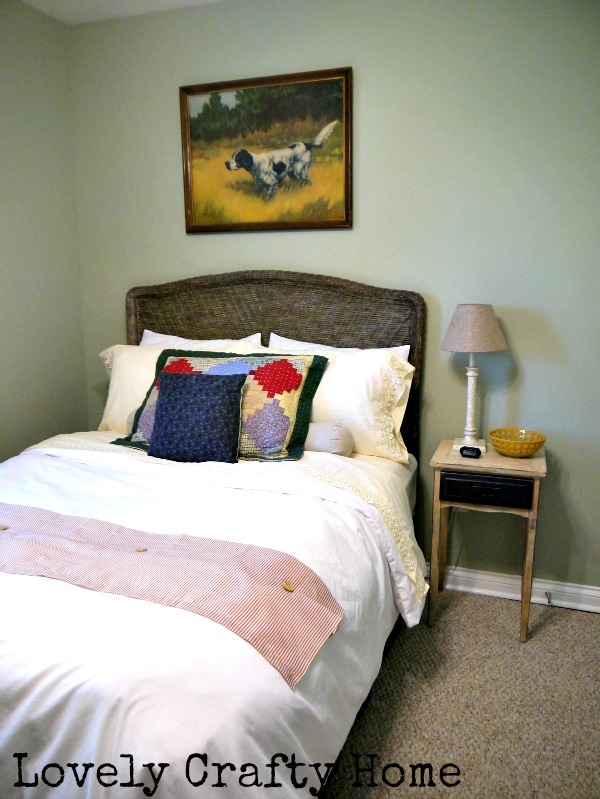 I started by transforming the once white wicker headboard. While at Walmart buying everything except what was on my list, I found the perfect airy gray fabric for curtains at $2/yd. I literally just bought it on the spot without having measured or checking the color or anything. The selvage edge was so cutely frayed, I didn’t hem it. Then it was off to hunt linens. I liked the white duvet (from the old guest room), but hated everything else. Fortunately I hit the jackpot at a local thrift shop, finding a blue/yellow plaid bedskirt, a quilted sham, and a red/white striped curtain valence that I had planned to cut up and use as accent fabric on a pillow. I picked up a set of sateen type yellow sheets with some cutout lace detail to round out the look. The total for everything was less than $25. 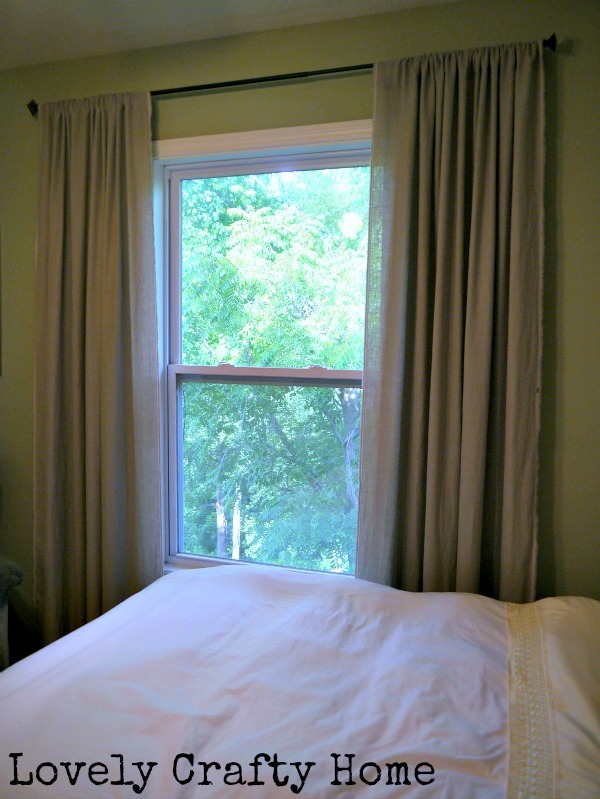 While I was working in the room, I laid the valence on top of the bed….and it never left. I’m calling it a bed scarf. I also finally finished the quarter round in the space, moved in a previously nomadic chair and my beloved pallet frame. 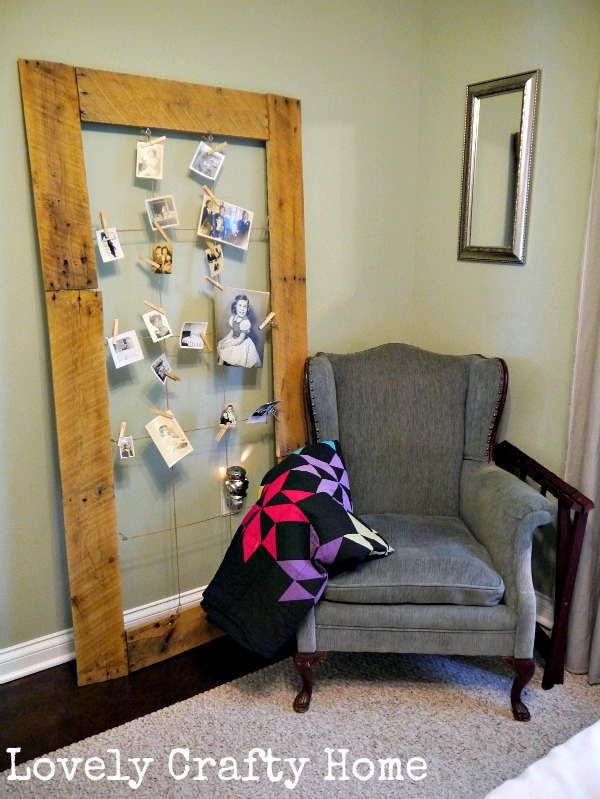 Old family pictures hang from clothespins. The mirror came from the old guest room and is currently hung in the most awkward spot ever. The quilt on the chair was made by Mike’s grandma for him as a kid! You may remember this next shot from an old Rachael and Restoration post (which is why there is no quarter round). The gilded frames with early American art play off the hunting dog picture above the bed. 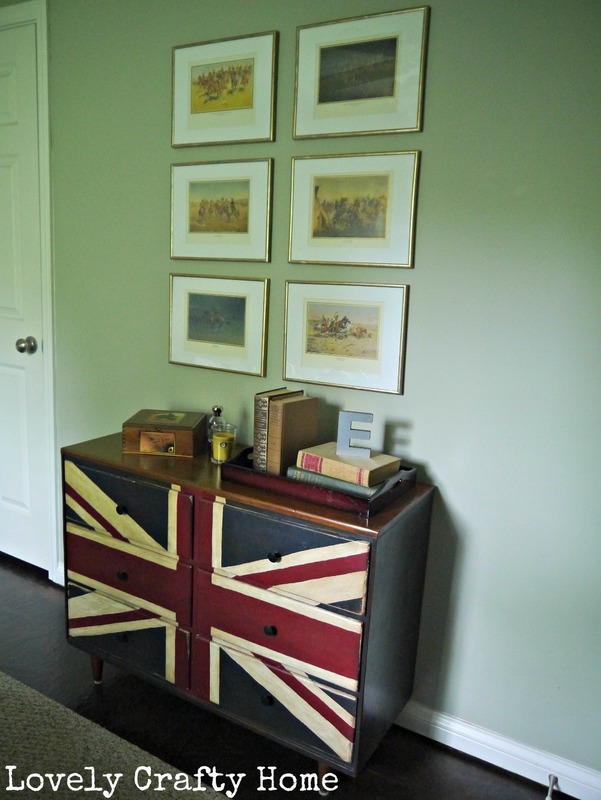 I’m just going to call my Union Jack dresser on par with the vintage patriotic look…I mean it’s not really American patriotic, but whatever 🙂 Same time frame. Ish. Mike’s grandma also made the small square pillow on the bed. She’s a hand quilter with some crazy skills! What do you think of my bed scarf? Cool? Creepy? I was going to use the red ticking around the ends of the drop cloth bolster pillow, but I kind of like it on the bed. The wooden buttons are cute. And the bed was just so white. So clearly there are still some finishing touches…namely filling some blank spaces on the wall and working on accessories, but I think it’s coming along pretty well. I really wish I had one of those cool vintage fans. I LOVE the bed scarf! I think it looks perfect. Love the buttons…do your kitties find them entertaining??? Love the room…very “early American with a twist”! Mary Fran- Thank you!! I’m sure the kitties would find the buttons entertaining, which is why the door stays closed all the time 🙂 I try to keep it animal free for guests. But whenever I’m working in there, they do try to sneak in!